The latest trend in the bedroom decor world is to store one’s clothing on clothes racks, not in a closet but out in the room. 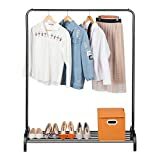 This creates a simplified, honest mood to a room, and can really become an art piece, depending on the style of clothes rack and the clothing displayed on it. It is incredibly easy to make a DIY clothes rack, so give it a try with one of these simple tutorials below. If you are looking to save some space or showcase your next outfit this DIY clothes rack will help you do just that. It is basically a wooden dowel hung from the wall by leather straps. But its humble appearance actually creates a modern, chic look. Make one in order to plan your outfits, or display your favorite dresses, the choice is yours! To create an industrial-looking DIY clothes rack, you’ll just need some copper pipe. The process couldn’t be simpler, and the effect is effortlessly chic for a low price. Make sure you purchase a tube cutter for this project because cutting through the copper pipe otherwise will be tricky! This whimsical DIY clothing rack would be perfect for a girl’s room! The wooden dowel, adorned with large wooden beads, hangs from the ceiling for a cool artsy look. Paint with pastel chalk paint for a fun look, or go with wood stain to keep things more serious. 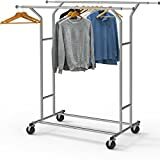 For a more practical purpose, you might like a large metal clothes rack. This tutorial video will show you how to make one! It has plenty of room for clothing, plus some shelves for storing shoes. You can fit 11 pairs of shoes on just one of the two shelves built into the rack, so this DIY clothes rack may just replace your closet altogether! You can also check this article for more DIY shoe rack ideas. For those of you who just want to make a cheap DIY pipe clothing rack for practical purposes, this tutorial is for you! 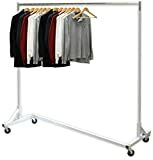 Made completely out of PVC pipe, this clothes rack is simple, light, and cheap. 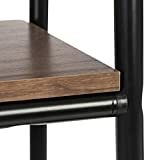 Another plus is that the rack can be deconstructed in a couple of minutes, so it makes moving a breeze. Putting wheels on anything makes it more practical and fun, so why not put some on a DIY clothes rack? 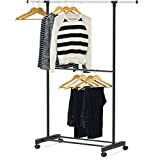 The design is space efficient, with two hanging racks staggered in height and two large wooden shelves at the bottom for shoes and other items. The whole rack rolls away easily on skateboard wheels, so it’ll be easy to move it wherever you need it to go! This is quite a simple DIY clothes rack to make, anyone with basic skills can pull it off. The list of materials needed is also very minimal, and there are no tools required whatsoever. The thing that might seem tricky at first is cutting the copper pipes, but you’ll get the hang of it pretty fast. You can make a baby clothes rack under five dollars with this DIY tutorial! 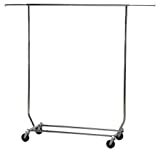 The rack is made from PVC, which makes the rack light but sturdy. It is small enough to fit into tight spaces but has plenty of room for all your baby’s clothes. Have your local hardware store cut the PVC for you for an even easier DIY project. If you need some extra storage space in your existing closet, or have an awkward corner in your room we recommend you make a wall-mounted clothes rack! You only need a few items to put this project together. Since the piping materials are threaded, assembling is a breeze! This DIY clothes rack looks industrial and tough, so it might be a great addition for a teen or little boy’s room. The next one on our tutorial list is this easy to make DIY clothing rack that anyone can complete in a matter of few hours. With medium skills and a bit of patience, you can too make your own DIY clothes rack cheap and easy. Watch the video below for the exact steps you need to take in order to make this DIY clothing rack. This delightful DIY is more of a piece of art than practical clothing storage. Made from a real branch from your backyard, this clothes rack is both rustic and chic! The DIYer in the video uses a floating shelf to hang the branch from, but you could hang it over a door or even from the ceiling! Making a DIY clothes rack literally couldn’t be easier than this ladder rack. All you do is paint a wooden ladder and hang it from the ceiling with eye hooks and a rope! If you need something quick or don’t want to take a lot of time building a clothes rack, this project is definitely for you. Making a clothing rack is fun and a fairly cheap way to change up a room. Any of these tutorials will definitely be cheaper than purchasing a kit or pre-made garment rack, so you’ll feel good about saving money as well as successfully building a cool DIY! Have you tried one of these tutorials, or have others to share? Comment below with your thoughts and suggestions!